Tail and ear biting is a welfare problem of growing (weaned) pigs that involves destructive chewing of penmates' tails or sometimes their ears. The injured tail or ears become attractive to other pigs in the group once the tail or ears bleed, and the syndrome grows until the bitten pig is severely injured. 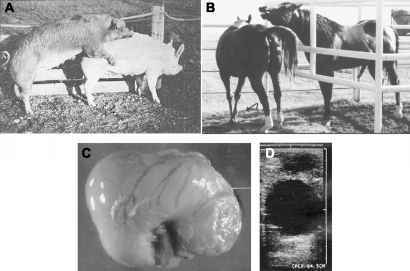 Tail biting, for example, occurs in two stages a preinjury and an injury stage and it is the second stage that results in wounding and bleeding and more severe consequences such as infection, spinal abscess, paralysis, and in extreme cases, death. Potential factors predisposing tail biting are numerous: poor ventilation, breakdown in the food or water supply, poor-quality diets, absence of bedding materials, and breed type. Underlying behavioral mechanisms for tail biting are not understood.